I believed that the seven churches John writes to in the second and third chapters of Revelation are not just churches that existed in John’s day. Each of these seven churches was also representative of the church “ages”. The last church mentioned, Laodicea is allegedly the “church age” we currently live in. The Laodicean church was the church that was neither “cold nor hot” (Rev. 3:15). It was the foolish, lukewarm church. Have you ever heard that “we’re living in the Laodicean age” of the Church? But is that true scripturally, and even logically? I don’t think so. There’s not one scripture to justify such a belief. To come to that conclusion, one would have to “infer” it onto the text. To do so seems to be “adding to the words of the book”, something strictly forbidden in the final words of Revelation. Let’s look into some of the reasons why this “church age” interpretation just doesn’t stand. In Revelation 1:4-8 St. John addresses his prophecy to the seven churches in Asia. It is obvious (at least to me) that he has these actual churches in mind. There is no hint or suggestion that we should interpret these verses as anything other than John writing to seven actual churches. John wrote to the seven Churches in Asia in the same manner that Paul, Peter, and others wrote to churches in the New Testament. 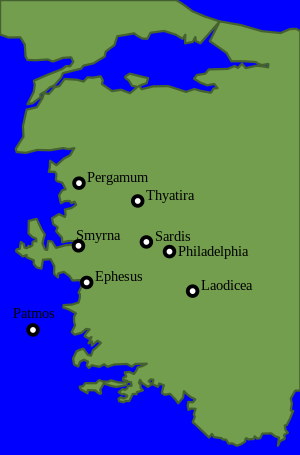 The seven Churches are enumerated in the order in which a messenger sent from Patmos would reach them. The seven Churches were on a common Roman government postal route. These seven cities, as has been already stated, were situated on a very important circular route. This route starts from Ephesus, the most educated, wealthy and historically important part of the Province. They were critical points on that circuit, serving as centers of communication with seven districts. While I can’t prove it my guess is that the reason John listed Laodicea last is that it was the last stop on this circular route. A messenger would have started at the port city of Ephesus. Then he would continue onto Smyrna, Pergamum, Thyatira, Sardis, Philadelphia and finally Laodicea. This is the exact order theses cities are listed in Revelation chapters two and three. The map below gives you a general idea of the orientation of the cities. But is there any application that we can apply to our day and age? Of course, there is. We can apply the teachings here just like we do with other things written in the New Testament that are spiritually relevant to us. But the idea that John is writing about ages of past and future Church history is pretty far-fetched and unscriptural. The “seven ages” doctrine assumes that the Book of Revelation covers all of Church history, from beginning to end. But John never hints that the Book of Revelation even addresses the history of the church. His only claim is that the prophecy covers “things that must shortly come to pass” (Rev. 1:1). John also declares that the time of which it speaks is “near” (Rev. 1:3). Will the Church End in Defeat and Apostasy? The “seven ages” doctrine assumes that the Church will end in defeat and apostasy. The Laodicean church is the lukewarm, practically apostate church, about which Christ has nothing good to say (Rev. 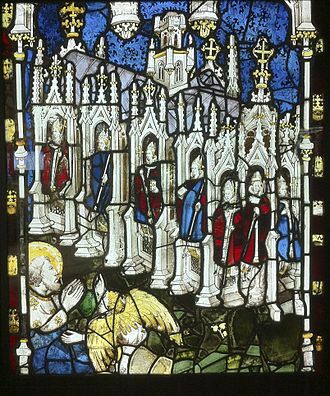 3:14-22). Is this really supposed to symbolize the Church of Jesus Christ at the end of the age? What a depressing doctrine if it were true. Where Do We Stand in Church History? The “seven ages” belief assumes that we are living in the last age of the Church. But stop and think how do we know where we stand in church history. Do you think the church 1000 years ago had any idea there were 1000 years of history still to go? Study church history and you will conclude that nearly every generation thought theirs was the last. Let’s pretend for the moment that Revelation chapters two and three do represent the chronological history of the church. But how would we correctly apply them to secular history? Wouldn’t our generation have to wait until the “end” has taken place? In other words, we wouldn’t know the “end” is upon us until the “end” is upon us! Is it fair to apply these verses to over two-thirds of the modern Church? Isn’t most of the church today (besides North American and Europe) under heavy persecution? They are not living in affluence like the Laodicean Church. How can these verses be applied to the persecuted underground church in China? Likewise, the church in the Arabia Peninsula is presently under severe persecution. In fact, I believe the church of Smyrna or Philadelphia fits the description of most of the Church around the world today. The “seven ages” doctrine just doesn’t make sense. And though we may not say that the seven churches represent seven periods in Church history, there is an important point to be observed here. The fact that seven churches are mentioned in a book packed with numerical symbols should not be overlooked. Seven is the number in Scripture that represents completeness or fullness. In Revelation, it might represent the fact that the Revelation is intended for the whole Church in every age. The messages to the seven churches of Asia are to be applied to all, just as Paul’s letters to the Romans and the Philippians have worldwide significance.